Common skin disorders are discussed which can be treated with physical therapy protocols. Skin is most often seen and touched by the physical therapist of all the body systems. The skin is the outer covering of the body. It is the largest organ of the body. The integumentary system i.e. the skin and its appendages (hair, scale, nail) has functional relationship with many other body systems. The health of the integumentary system is dependent on the normal functions of the arterial, venous and lymphatic capillaries (dermal circulation). The epidermis is avascular and water resistant. It provides protection from infection, abrasion and chemicals and assists with heat regulation, retention and dissipation. Melanocytes determine skin colour and provide protection from ultraviolet radiation. The epidermis regenerates rapidly. The dermis is 20-30 times thicker than epidermis. It contains blood vessels and lymphatic; hair follicles; sweat glands, and sebaceous glands; nerves and nerve endings; and collagen, elastin, and ground substance that provide structure, strength, flexibility and elasticity. The nails are located in dermis but project through the epidermis to the surface of the skin. The hypodermis (also referred to as subcutaneous layer) is not a part of the integument but is important in stabilizing skin over skeletal muscles and organs. It consists of loose connective tissues and fat cells and provide insulation and protection to underlying structures. In case of skin conditions, which may be result of injury or disease of some or all the components of the integument are impaired, resulting in sequelae such as oedema, decreased lubrication, sensory loss or loss of elasticity and tensile strength. 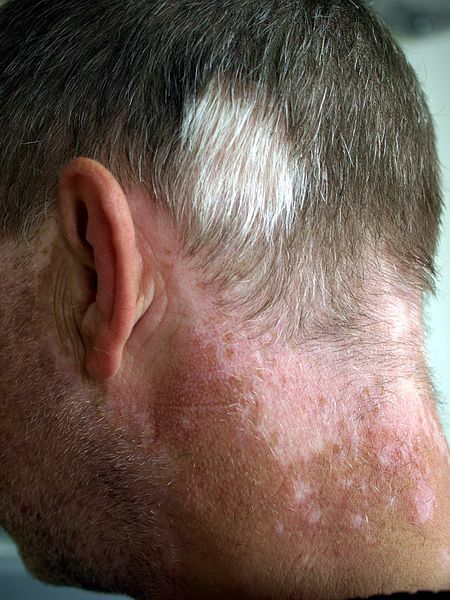 Patients and clients with disorders of skin have complex needs. These videos below provide insight on various skin conditions normally dealt with.